Car floats and Ferries present unique visual and operating interest in model railroads. I am always captivated by any design where a port or water-railroad interface happens. A ferry or float operation brings the added interest of a built in fiddle yard. Between operating sessions just replacing the cars changes the whole scenario. 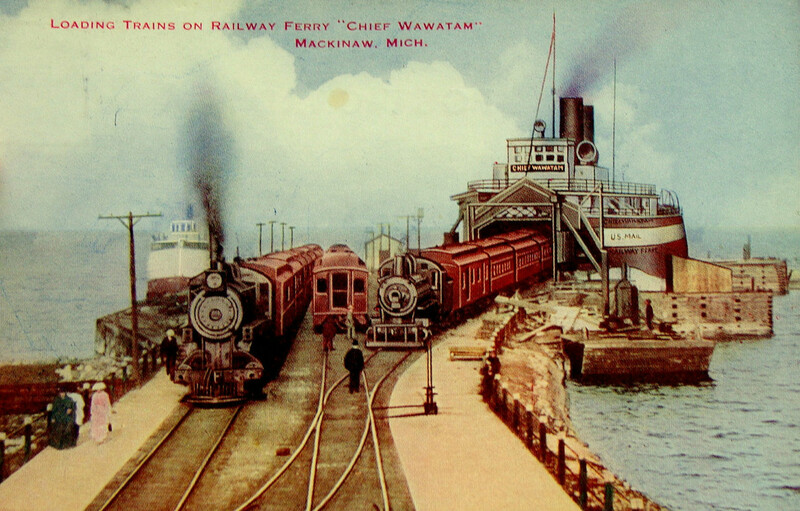 I recently came across an image of the Chief Wawantam at Mackinaw Michigan. The Chief Wawantam served the straights of Mackinaw from 1911 to 1984. Three railroads (Duluth, South Shore & Atlantic, Pennsylvania and New York Central) kept the Chief Wawantam busy during those years. The image shows a very busy dock area servicing both passenger traffic and freight onto the Chief Wawantam. To model the whole scene would take a lot of space. The dock was over 1200 feet long which equates to over 14 feet in HO scale. Instead I decided to design a small layout with a small car float operation that included a dock. Model Rail Radio was also having a contest for small layout designs so I used their 60 x 18 inch dimensions as the maximum size. After several tries I came up with a couple plausible plans. The first has the dock out front and the car float coming in from the right. this works if you have access to the RH side of the layout to change out the cars. Of course if you had that room you probably would have built a larger shelf layout. I also did not like the shape of the dock and felt the operations did not make sense since cars came in on the float only to be moved to a dock. In my second plan I placed the float in the front. The sidings were placed along the rear RH edge. The layout creates some interesting switching dilemmas Cars must be spotted in the correct locations with only minimum space to do it. The plan has been submitted to Model Rail Radio for their small layout design contest. The host, Tom, tells me I can submit as many plans as I want. I think he will be hearing from me again. I have a fellow modeller close to me, who models the Hudson RIver rr’s. His layout is called the NY Harbor RR, http://www.youtube.com/user/NYHarborRailroad. Floats are an fascinating aspect of river crossing. Odf course today its UNDER the Hudson River! Nice design you made!